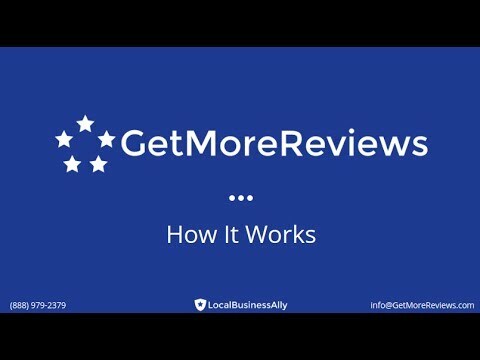 GetMoreReviews is a cloud-based review generation and reputation management solution which utilizes automated review requests to encourage satisfied customers to leave 5-star reviews online, while blocking negative reviews by recording customer complaints and negative feedback without publishing them. With GetMoreReviews, users can send review requests via SMS or email, either in bulk or one-by-one. The actionable requests involve few steps, with the aim of increasing review conversion rates. For customers who would recommend the business, reviews can be left on Google, Yelp, or Facebook, and review forms are pre-populated with a 5 star rating to encourage customers to leave positive reviews. 4- and 5-star reviews can be posted automatically to business websites and connected Facebook and Twitter profiles. If a customer says they would not recommend the business, they are instead provided with a feedback form which is sent directly to users, rather than being published online. Users can then respond to customer complaints without negative reviews being left. GetMoreReviews automatically notifies users when new reviews have been left or they have received negative feedback. All reviews can be monitored from a single dashboard, with users able to read full reviews, share reviews, and publicly respond. Automated reports give users an overview of their average rating, review volumes, new reviews, review distribution, listings strength, and more. I researched all the different programs in this genre-Review Trackers, Birdeye etc. I had my top three and they pretty much all did the same things. It’s just that Get More Reviews was at least half or more of the cost of the other review software. That was it for me. To get everything that I want and need for half the price, Get More Reviews was my choice and I haven’t regretted it for a second. We’re a start up company, so our budget is tight. I have to choose very carefully what we spend our money on, and to me online reviews is the key to success. With online reviews on sites that you can’t advertise on, for example, Nextdoor, you are getting business/leads for free. We got a call yesterday, and the man said that he chose us off of Nextdoor because we had more reviews than anyone else. The money we spend on Get More Reviews will pay off exponentially in the future and it will get us to the top of search engines and this will all translate to higher sales. Try Get More Reviews. It’s simple and inexpensive and it WILL pay off!I like that all of my reviews are in one spot, so that I can easily see them and respond to each review quickly. I love that it sends out requests for reviews. This is a huge timesaver for me. I was emailing each one of my customers manually and it would take forever. Also, I would only send one request to a customer. GET MORE REVIEWS sends 3 out and also sends text messsages, as well. The amount of reviews that we have received has tripled in the short time we have been using this program. I think it will get even better over time. I appreciate that their sales department set up a dedicated training session to teach us everything about their program. They were only supposed to spend 45 minutes with us, but we ended up working for about an hour and a half. I was having trouble with my Internet and they were patient and helped me through getting everything up and running. They have a bot on their site, so if you need help at anytime during the day, you don’t have to send an email and wait a day for a response or sit on hold making a phone call. You just ask it a question, and get an immediate response. I like that all of my reviews are in one spot, so that I can easily see them and respond to each review quickly. I love that it sends out requests for reviews. This is a huge timesaver for me. I was emailing each one of my customers manually and it would take forever. Also, I would only send one request to a customer. GET MORE REVIEWS sends 3 out and also sends text messsages, as well. The amount of reviews that we have received has tripled in the short time we have been using this program. I think it will get even better over time. I appreciate that their sales department set up a dedicated training session to teach us everything about their program. They were only supposed to spend 45 minutes with us, but we ended up working for about an hour and a half. I was having trouble with my Internet and they were patient and helped me through getting everything up and running. They have a bot on their site, so if you need help at anytime during the day, you don’t have to send an email and wait a day for a response or sit on hold making a phone call. You just ask it a question, and get an immediate response. I haven’t found anything so far that I don’t like. It is user friendly and does everything I was hoping for and then some. I wish I had some constructive criticism for you, but really I haven’t found anything wrong with Get More Reviews. I am getting online reviews almost daily from my actual patients. It is so wonderful to see what my patients think about their experiences in my dental office, and even more so when they post them online. This helps a lot in our marketing, and in our online reputation. I have more and more patients commenting how they found so many good reviews about our office, and I even have people applying for jobs at our office because of the reviews they found about us online. And my time investment has been minimal. So I'm a very happy user/customer.I have been using this company for over a year now, and they have delivered more than promised and charged less than I expected. To be blunt, I have recommended them to anyone and everyone interested in online reviews. I am a total fan of this team and service. the price would be hard to beat, and the service is fantastic. They've helped my business tremendously and helped me to attract more patients to my dental office. If it weren't for their services I would still have less than 100 reviews online, and now I have almost 300, and all of that in about a year of working with them. I was very skeptical at first. They seemed like a smaller company at first and I'm used to working with larger nationally known companies. But I must say they have had NO problems with me, and I've been very happy with their service. Any skepticism I had was completely removed. Thank you to the whole team at Get More Reviews! I have been using this company for over a year now, and they have delivered more than promised and charged less than I expected. To be blunt, I have recommended them to anyone and everyone interested in online reviews. I am a total fan of this team and service. the price would be hard to beat, and the service is fantastic. They've helped my business tremendously and helped me to attract more patients to my dental office. If it weren't for their services I would still have less than 100 reviews online, and now I have almost 300, and all of that in about a year of working with them. I was very skeptical at first. They seemed like a smaller company at first and I'm used to working with larger nationally known companies. But I must say they have had NO problems with me, and I've been very happy with their service. Any skepticism I had was completely removed. Thank you to the whole team at Get More Reviews! There is not a lot that I can say about negatives for this group. They have helped me and my company a lot. If I were to say anything negative about these guys, I'd say that they probably need to do more marketing. I wish I would have found them sooner, and if they had been more out there, I probably would have! It didn't help with any of my goals to obtain reviews for a large thriving business in South Carolina. From the problems I listed in the "cons" section of this review, I decided to search for a system that doesn't require a client to login to a google/facebook/etc account to leave a review, because with older populations you can't expect them to create an account to leave a review. In order to do this you need a third party system and I chose "Trustpilot" it has a lot higher conversion rate because there are less steps to convert, the problem with them is they do not have a "text" option which means you have to have a texting marketing service to do this. Texting does get more activity very quickly vs. email request for reviews. To be honest, getmorereviews is a really good at sending out review requests. It allows you to send phone (text) and emails. This is a great feature. It will also stop negative reviews... Again awesome feature. It is also easy to use. To be honest, getmorereviews is a really good at sending out review requests. It allows you to send phone (text) and emails. This is a great feature. It will also stop negative reviews... Again awesome feature. It is also easy to use. The biggest problem with getmorereviews is when a request is sent to some one, sends them to a landing page that has a star rating then sends them to the companies review page. This is a problem because it doesn't convert the request to an actual review. The recipient thinks by clicking one of the stars, they are leaving a review. Then when they are sent from that landing page to the actual company google, facebook, or other platform they don't want to sign in or they ignore it because, again, they think they left the review already by selecting the star. If the review doesn't convert it's not worth any money you pay for it. We have been able to get online reviews daily since we added this service increasing our online visibility.It makes it simple for clients to share their positive feedback and write a review. We have had tons of customers over the years write us thank you notes and emails but very few online reviews because of the effort involved in remembering to log on and do so. It makes it simple for clients to share their positive feedback and write a review. We have had tons of customers over the years write us thank you notes and emails but very few online reviews because of the effort involved in remembering to log on and do so. I don't like the fact that when they get a thumbs down there is still small print to show there where to share feedback online though it has been explained to me why this is added. No software is perfect. The generally I don't have any complaints about my experience with get more reviews. 14-day free trial available (requires credit card). Review requests can be sent out to customers by SMS or email, with pre-populated 5-star review forms to encourage customers to leave a positive review. Customer sentiment can be checked before they post a review, so that negative feedback can be processed privately ‘offline’ without customers leaving a 1-star reviews online. Customizable, automated email reminders encourage customers to leave reviews or provide feedback to the company. 4-star and 5-star reviews can be published to company websites and shared through linked social accounts automatically, and an embeddable reviews tool allows customers to leave reviews directly through the website. All reviews can be monitored from a single dashboard, and users can receive email alerts for new reviews, and schedule regular reports on their online reputation. Below are some frequently asked questions for GetMoreReviews. Q. What type of pricing plans does GetMoreReviews offer? Q. Who are the typical users of GetMoreReviews? Q. What languages does GetMoreReviews support? Q. Does GetMoreReviews support mobile devices? Q. Does GetMoreReviews offer an API? No, GetMoreReviews does not have an API available. Q. What other apps does GetMoreReviews integrate with? Q. What level of support does GetMoreReviews offer?